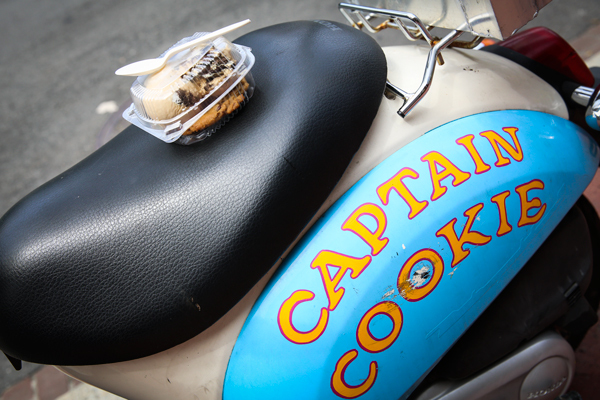 Captain Cookie is a GW dessert staple that delivers cookies daily until 4 p.m.
Got the late night munchies? Don’t worry, we’ve all been there. Thankfully, the District’s delivery game is strong, especially for those with a sweet tooth. GoPuff is an online grocery store that carries everything from Kinder bars (two for $2.79) to boxes of Franzia ($17.95) to smoking sundries, like the Debowler ($4.95). A one-stop shop that’s open 24/7, you can grab a tube of toothpaste with your late night Ben & Jerry’s delivery. They even have a Munchies selection chock-full of sugary goods so you can treat yourself at any hour of the day. Although GoPuff tends to jack up its prices for individual items, its delivery fee is easily one of the cheapest around – they charge a flat fee of $1.95 per delivery, or free delivery with a purchase over $49. GoPuff uses a points system – dubbed Puff Points – to encourage customer loyalty. The more often you order from GoPuff, the more points you earn, which you can later use to redeem prizes such like P.I.M.P. Red Hookah (750 points) or a six-pack of pong balls (100 points). If there’s a need-to-know name in food around campus, Crepeaway is it. Crepeaway is the perfect way to end your wild nights out or your lazy nights in, because they deliver their delicious sweet or savory crepes to your door in 30 minutes or fewer for $2.50, if you live on or near campus. For the uninitiated, this delivery speed is unheard of in a city that usually takes an hour minimum to deliver anything, much less a piping hot crepe. This GW institution delivers until 11:30 p.m. on Sunday through Wednesday, 3 a.m. on Thursdays and 4 a.m. on Fridays and Saturdays. This dessert spot is a favorite among GW students for a reason – it’s fast, convenient and the cookies are always warm. It’s a short walk from any of the Foggy Bottom dorms, but sometimes you don’t want to have to leave your bed to enjoy a perfectly-sized chocolate chip cookie with a side of cold milk. You can order delivery online from Captain Cookie’s website with no delivery minimum and a $10 flat-rate delivery fee. But if you want to order a light night snack you’ll have to go through Postmates or Seamless, because Captain Cookie doesn’t accept deliveries past 4 p.m.
With flavors ranging from nutella to funfetti at $1.25 a piece or $7 for a half dozen, you can’t go wrong with this GW staple. Don’t bother with the lines at this recently opened chic bakery. If you’re tired of the milkshakes at Foggy Bottom staples like Burger, Tap & Shake and T.G.I. Friday’s, try a cereal milk shake: It’s pricey at $6.50, but the joys of drinking the sweet dregs from your cereal bowl in ice cream form are priceless. And if you want a unique dessert altogether, try the “Crack Pie,” which has a gooey, buttery filling and a crunchy oat crust. A slice will cost you $5.50, but perhaps you want to share a whole pie with your five other roommates. If you all chip in for the cost, the $44 price tag doesn’t have to be a dealbreaker. You can order through Postmates until Milk Bar closes at 11 p.m.